The high pressure system that has shunted storms away from California for much of the past four years has dissipated, possibly for a long time. The Ridiculously Resilient Ridge — as meteorologists and forecasters have dubbed the system because of its unusual persistence — has been absent for more than a month, according to a forecaster with the National Oceanic and Atmospheric Administration. “It hasn’t been like that since August really, and instead we’ve had sort of more variable weather patterns,” said Nate Mantua, a research scientist with NOAA’s Southwest Fisheries Science Center in Santa Cruz. Mantua said the ridge will likely stay away, because it will have been replaced by a low-pressure trough. “The expectations are as we get into Fall and Winter seasons more deeply, we’re going to see a lot more low pressure there, and that will be the more sort of dominant story,” Mantua said. Eric Boldt, a meteorologist with the National Weather Service in Oxnard, said low-pressure systems typically accompany El Niño events. “Lower pressure in the Eastern Pacific is a classic pattern you’d see with an El Niño setting up with the jet stream a little more to the south, and that’s were we get into our storm track coming up from the southwest across California,” Boldt said. The high-pressure ridge has created a large swath of unusually warm water off the coast. Boldt said the warm water would take months to dissipate and that its interaction with El Niño isn’t well understood. However, he said storms from strong El Niño events, which can bring heavy rains to California, could be bolstered by the warm water. “That’s the part that is a little bit unprecedented. We don’t really have a good idea about how that might impact us, but warmer ocean temperatures typically lead to fueling the atmosphere and kind of energizing those storms. So I don’t think it’s going to be a negative for us,” Boldt said. Mantua said the disappearance of the ridge and the presence of a strong El Niño is likely to produce a lot of rain in Southern California. “[The low-pressure system is] just another factor that sort of favors a more normal winter, although I don’t think it’s going to be normal. I think it’s going to be probably an exciting winter, especially for Southern California,” Mantua said. It’s a fascinating time to be an Alaska fish biologist, charter operator or angler. With warmer ocean temperatures caused by El Nino and a phenomenon called “The Blob,” bizarre fish sightings are pouring in from around the state, particularly Southeast. Scott Meyer, a state fishery biologist based in Homer, is amassing photos from colleagues and boat captains who have hauled in everything from a 900-pound ocean sunfish near Juneau to warm-water thresher sharks off the coast of Yakutat since July. “It’s unusual to have these fish caught in near-shore fisheries,” Meyer said. The peak of the 2015-2016 El Nino is approaching, with this year’s event among the strongest on record, according to the National Oceanic and Atmospheric Administration. The Blob has raised temperatures in the North Pacific to record highs of about five to seven degrees Fahrenheit above average, according to NOAA. Joe Orsi, a federal fisheries biologist in Juneau, said two massive sunfish swam into researchers’ gear in Southeast this summer as they conducted juvenile salmon surveys. Sunfish tend to favor warmer waters than those found in Alaska. Other unusual reports include Pacific bonito caught in waters off Ketchikan, albacore tuna spotted near Prince of Wales Island, and yellow tail caught near Sitka. As recently as last Saturday, an ocean sunfish washed ashore outside a lodge in Cordova. Steve Moffitt, the state biologist who dissected the sunfish, said pilots and fishermen have reported several sightings of sunfish this summer. They were likely chasing the warmer currents and a huge mass of jellyfish that filled the waters around Cordova, he said. “Sunfish really like to eat jellyfish,” Moffitt said. California market squid are also starting to spawn in Southeast, Orsi said. While the usual fish sightings are interesting from a biological perspective, they may be a cause for concern, Orsi said. One of his top questions: if ocean temperatures rise, how will big-money fish like salmon be affected? The Alaska Department of Fish and Game forecast the Southeast pink salmon harvest in 2015 at 58 million fish, yet fishermen hauled in only about 34 million pinks, according to state records. Did The Blob and El Nino cause the low catch level? Hard to say definitively but it’s “certainly easy to point the finger at them,” said Dave Harris, Fish and Game’s commercial fishery management biologist in Juneau. “Those are the most likely suspects,” Harris said. El Niño: When will it start raining in California? A bill that will permanently allow Washington, Oregon and California state fishery managers to jointly manage the West Coast Dungeness crab fishery cleared its first hurdle in Congress this week. HR 2168, the West Coast Dungeness Crab Management Act, proposed by US Rep. Jaime Herrera Beutler (R-WA) and backed by state Senator Maria Cantwell, passed the US House this week and will now go up for Senate approval. If approved, the law will allow Washington, Oregon and California to continue their work– at a state level–to manage the West Coast Dungeness Crab Fishery. The bill actually extends a measure approved in 1996 that allowed the three states to work with the Pacific States Marine Fisheries Commission to manage the stocks and conduct fishery science. It represented a unique marriage of state and federal fishery management. The 1996 accord is set to expire in 2016, but Beutler’s proposal would make the state and federal pact permanent. “The successful, two decades-old tri-state Dungeness crab management agreement will expire the on September 30, 2016. This bill simply makes that working management authority between Washington, Oregon, and California permanent,” said Beutler. This bill will now go before Congress where some industry sources say it has a 68 percent chance of approval. Name any winner at any Olympics at any event in track and field and this much is almost certain, a new research paper argues: A wide variety of athletic fish would blow right by them. Trout, salmon, tuna and other fleet fish are capable of producing far more oxygen in their bodies for mind-blowing performance. “Fish exploit a mechanism that is up to 50-times more effective in releasing oxygen to their tissues than that found in humans,” said Jodie Rummer, the lead author of the study and a researcher at the ARC Centre of Excellence for Coral Reef Studies at James Cook University. “This is because their hemoglobin, the protein in blood that transports oxygen, is more sensitive to changes in pH than ours and more than the hemoglobin in other animals,” she said. That’s right, other animals. The humble trout and salmon, not to mention powerful tuna, can also blow away some of the fastest mammals on land. Fish have developed this ability for longer than humans can imagine, given their standing as some of the first organisms to form hundreds of millions of years ago. Humans run marathons. Salmon swim entire coastlines and tuna swim around the world. When they’re challenged – which generally means chased by predators – they really get on their horse, flying underwater at incredible speeds. Humans catch them easily, but advance fishing tools and methods cheat nature. A quick getaway from predators isn’t the only skill fish evolved to survive. Conditions in water can change dramatically, especially with humans around adding phosphorous, nitrogen and acidity to water. In areas of low oxygen in water, such as a problem known as dead zones that leave them sucking for air, they can double or triple oxygen delivery to their tissue. The study was published early this week in the journal PLOS One. Researchers have used rainbow trout to understand how fish deliver oxygen for the past decade. First they tested how it’s done by monitoring rainbow trout muscle oxygen levels in real-time. Then they compared the results with medical studies of humans to show how much more powerful fish like trout and salmon are. “This information tells us how fish have adapted this very important process of getting oxygen and delivering it to where it needs to be so that they can live in all kinds of conditions, warm or cold water, and water with low oxygen levels,” Rummer said. Many elite runners have taken to wearing elevation training masks that reduce their oxygen intake, hoping to simulate breathing at a higher altitude to better their performance. Fish don’t need a mask. They’re born that way. “This trait may be particularly central to performance in athletic species, such as long-distance swimming salmon or fast swimming tuna,” said Colin Brauner, a University of British Columbia researcher and study co-author. Crews from the Alaska Fisheries Science Center caught two large ocean sunfish far to the north of where the species usually occurs. Photo credit: AFSC. The emerging El Niño climate pattern that is warming the tropical Pacific Ocean is likely to continue–and could even increase–the appearance of marine species in unfamiliar places along the West Coast. This trend started with a vast “warm blob” of high temperature waters that has dominated the Northeast Pacific since 2014. Previous El Niños coincided with large-scale redistribution of some West Coast marine mammals, fish and sea turtles. The combination of an anticipated strong El Niño and the blob may do the same, possibly in new and different ways, NOAA Fisheries researchers say. “One of our big questions right now is, how can we best link observed changes in species distributions to changing environmental conditions?” said Dave Weller of the Southwest Fisheries Science Center in La Jolla, California. Weller is chief scientist for the ongoing Collaborative Large Whale Survey, a joint survey for whales off the West Coast and Southeast Alaska by the SWFSC and Alaska Fisheries Science Center. “We need to be clever about it in terms of using a range of observations and having eyes on the water in the form of ship surveys like this can really help,” Weller said. NOAA Fisheries scientists have been tracking the blob since last year and are cooperatively following continued changes in ocean conditions through at-sea surveys, remote sensing and automated monitoring to understand how the changes are affecting marine ecosystems. The blob has already driven temperatures in the North Pacific some 3 to 4 degrees C (about 5 to 7 degrees F) above average. Not since records began around 1900 have temperatures in the region been so warm for so long. Already in the last month the survey spotted about 25 pilot whales around 50 miles off the Central California Coast. Pilot whales were once common off Southern California but largely disappeared following a strong El Niño pattern in the early 1980s. In the last few years pilot whales have begun to trickle back into the area, a sign they may be starting to reoccupy former habitat. “This recent uptick in pilot whale sightings may be related to the warm blob’s influence,” Weller said. “If we pay close attention to the animals, they’re telling us something about changes in their environment. We now need to connect the puzzle pieces.” Scientists are also investigating connections between the blob and a harmful algal bloom along the West Coast that may be a factor in an unusual number of whale deaths in Alaska. Rockfish surveys conducted by the SWFSC in May and June already showed the likely influence of warm water from the blob, turning up large catches of species typically seen during strong El Niño periods, and some never before seen in the survey. They included record high catches of pelagic red crabs and California spiny lobster, and the survey’s first-ever catches of warm-water species including greater Argonaut (a swimming octopus with a shell), slender snipefish and subtropical krill. Offshore surveys by the AFSC pulled in warmer-water species including two large ocean sunfish and market squid, species which have not been seen in the prior 18 years of sampling, said Joe Orsi of the AFSC’s Auke Bay Laboratories. Other warm-water species reported from Alaska recently include albacore, bonito and yellowtail. 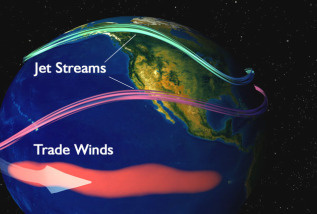 “This El Niño is liable to bring some really strange changes in ocean conditions because the widespread warming of the North Pacific we saw with the blob was so far outside of our experience,” said Northwest Fisheries Science Center oceanographer Bill Peterson. “When you put an El Niño on top of that it is anyone’s guess as to how this will affect marine organisms.” He tracks types of plankton off the Central Oregon Coast for insight into ocean conditions. He expects a new surge of warm-water plankton as the tropical El Niño begins to influence Oregon waters this fall. Salmon and other species that thrive in cold water often do poorly in warm years, especially strong El Niño years, he noted, while species such as sardines that favor warmer water could do better. Now another key question is how the tropical El Niño and the blob may interact as El Niño gains strength and begins to affect the West Coast this fall and winter. In terms of size, El Niño far exceeds the blob and is expected to pummel the blob with storms that will likely break up the blob and push its warm water up along much of the West Coast, said Nate Mantua, leader of the SWFSC’s Landscape Ecology Team. That will likely make this the third winter in a row with record-high coastal temperatures that affect both marine ecosystems and the coastal climate. El Niño typically shifts the jet stream in a way that redirects storms from the Pacific Northwest to Southern California instead. “Because we’re starting from an exceptionally high baseline temperature this could take us further into uncharted territory in terms of effects,” Mantua said. He said there is potential for the warm coastal temperatures to “supercharge” storms spawned by El Niño. Since warmer air holds more moisture storms may carry greater precipitation ashore, which could lead to more intense deluges on land. That could multiply the impacts of this summer’s large wildfires by pouring water on recently burned slopes. “If you put heavy rains on that, you can get mudslides, debris flows, rapid runoff and other serious impacts,” Mantua said. California sea lions will likely continue to struggle as the warm water temperatures lead to shifts in prey, he said. Record numbers of starving sea lion pups stranded on Southern California beaches last winter and spring as their mothers had a harder time finding food near their rookeries in the Channel Islands. Investigations of the sea lion strandings by AFSC researcher Sharon Melin and others found that adult females could not maintain enough lactation to support normal pup growth. In July 2015 AFSC biologists recorded declines in the number of sea lion pups born on San Miguel and San Nicholas islands, another sign of nutritional stress in the population. Mantua noted that El Niño effects extend far beyond the West Coast of North America. Dry conditions in Central America have already led to restrictions on the size of ships that can transit the Panama Canal because of lack of water, for instance. Meanwhile heavy rains are falling in the Peruvian desert. “This El Niño will likely cause extreme climate events in different parts of the world for the next six to nine months,” Mantua said. The way that El Niño interacts with the warm blob may depend on the depth and extent of the blob’s warm water, which remains something of a mystery, said Toby Garfield, director of the SWFSC’s Environmental Research Division. If it’s shallow, it should dissipate quickly. But if it’s deeper, the larger volume of water may hang on longer. Marine scientist are mobilizing partnerships to make the most of ocean monitoring instruments along the West Coast. New instruments such as autonomous gliders that survey ocean conditions may offer opportunities to gather marine data that was not available during previous El Niños, Garfield said. Q: Does canned fish like tuna and salmon have the same nutritional value as fresh fish? The canned products are certainly cheaper, available and convenient. A: Yes, fresh and canned fish have roughly the same nutritional value, according to experts and the United States Department of Agriculture’s National Nutrient Database. And whether to eat one over the other isn’t an obvious choice, because each has advantages and disadvantages, said Alice Lichtenstein, a professor at Tufts University’s Friedman School of Nutrition Science and Policy. Canned tends to be cheaper and easier than fresh, with a longer shelf life. But it also tends to have more sodium than fresh, she said, and many people prefer the taste of fresh. Canned fish is also more likely to be wild than farmed, said Kristin Kirkpatrick, a registered dietitian and manager of nutrition services at the Cleveland Clinic Wellness Institute; some types of farmed fish have been found to be high in pollutants. Plus, canned fish such as sardines generally provide more calcium, because the calcium-rich bones are softened by processing and therefore more likely to be eaten. In terms of mercury levels, a particular concern for pregnant women, Dr. Lichtenstein said she suspected that canned fish like salmon probably contains less mercury than fresh, because smaller-size fish, which carry less mercury than larger ones, are more likely to end up in cans. 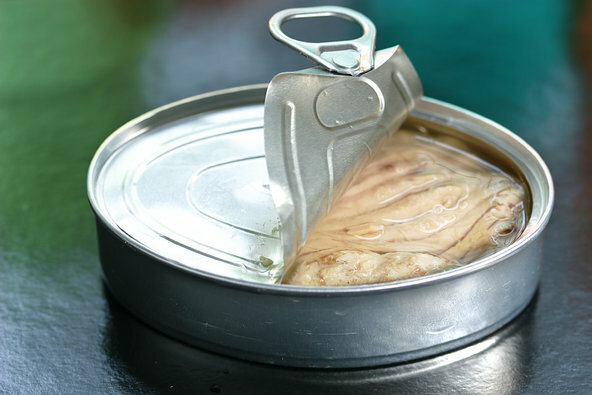 If you choose canned, fish canned in oil is more likely than fish packed in water to retain more omega-3 fatty acids, considered good brain food, Ms. Kirkpatrick said, because the oil helps keep the nutrients in the fish. Oil adds extra calories, but if packing in oil means someone will eat fish they wouldn’t otherwise, it’s worth it, Dr. Lichtenstein said. 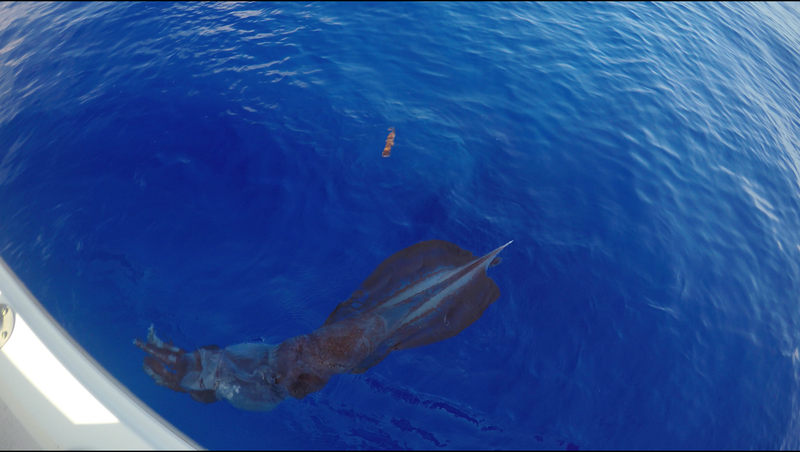 A fishing charter off the coast of Hawaii encountered a rare and beautiful sea creature this week: a 7-foot-long giant squid. The creature was dead, floating motionless with the bulb of its head sticking out of the water. 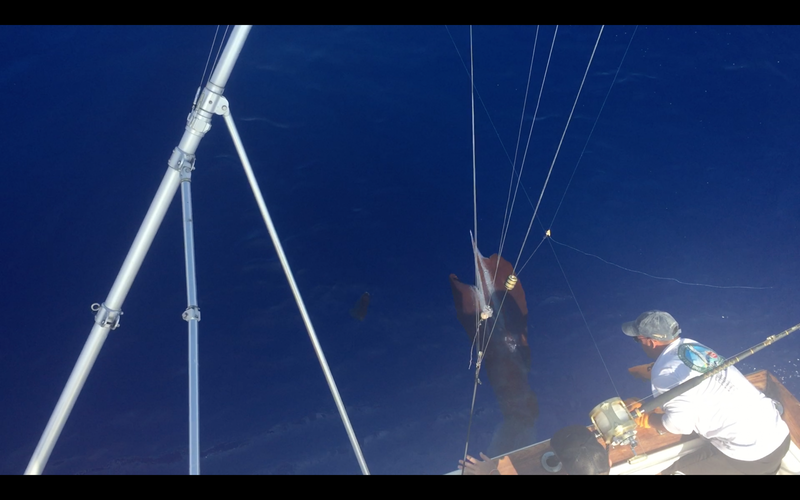 “It was a fishing charter and we had just released a blue marlin. 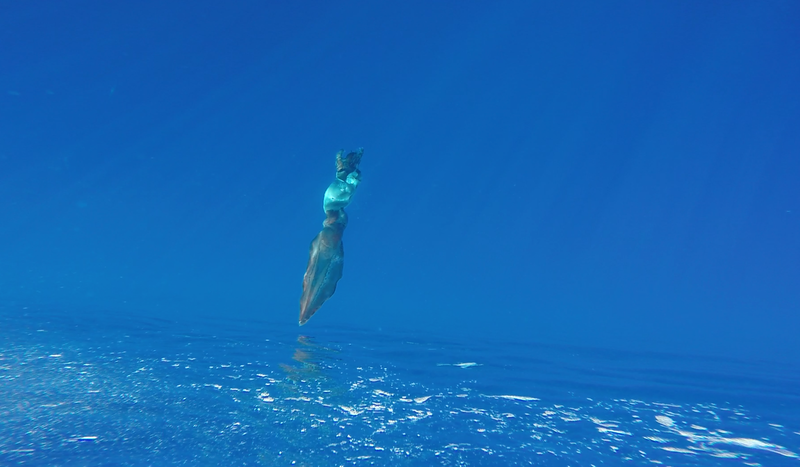 We were just getting the line set back out and my guest actually said, ‘Hey, what is that floating over there?’ We got closer to investigate…as we got close I realized it was a giant squid. It was already on the surface. In Hawaii, we have extremely clear water. We could see his entire body,” explains boat captain Cyrus Widhalm of Kona Sea Adventures. This is the first time in Widhalm’s 10-year boating career that he has seen such a creature. He was fishing in extremely deep water when they made the discovery, he says. Once they were close to the squid, Widhalm called a local marine biologist who recommended the crew pull it on board and bring it back to land if it was, in fact, dead. Widhalm and his crew then had to carefully check that the squid was deceased. “It appeared dead but we weren’t totally sure. My deck hand and I, Manny Billegas II, we reached out over the side of the boat. We didn’t realize how heavy it was. I held him in place as he reached down to get it because we were worried a tentacle would reach out to grab him. Once we were sure it was dead, I got into the water. I pushed it up and he pulled it out,” Widhalm tells Newsweek. 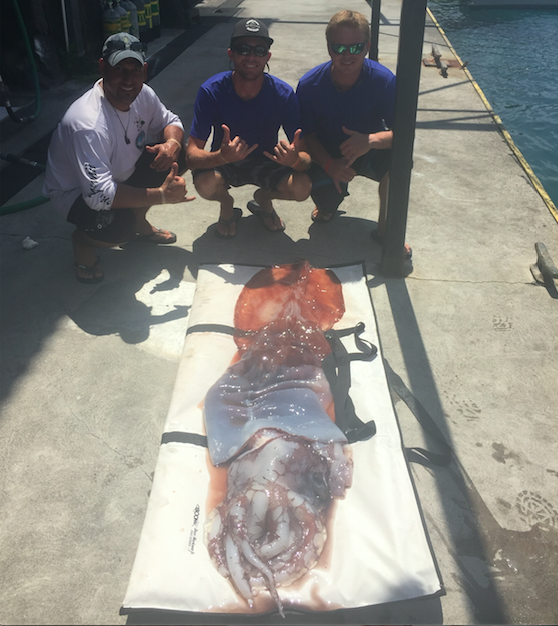 Because of the squid’s size, the entire crew became involved in getting it on shore: Ian MacKelvie, also a deckhand, and anglers Mathew and Miriam Fowler helped out. 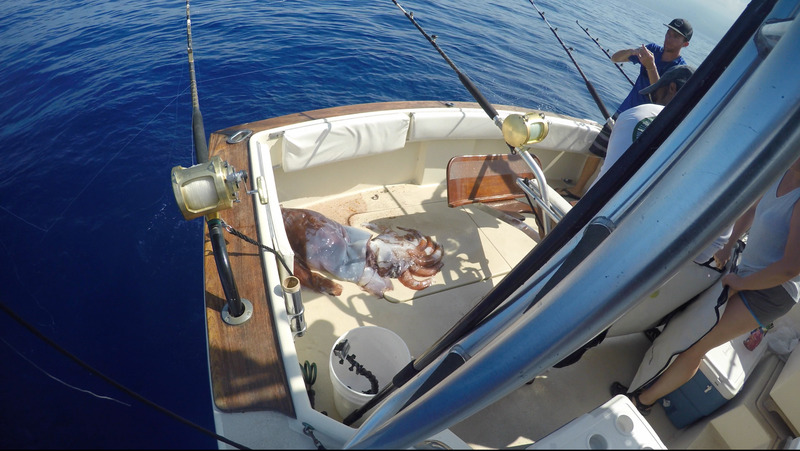 The boat traveled back to a dock in Kailua-Kona and the squid was pulled onto dry land. It was laid on a 72-inch fishing bag and exceeded the size of the bag, leading Widhalm to estimate the squid is at least seven feet long. “It might be the biggest one of that species ever found. There had been another brought in that was half the size,” he says. 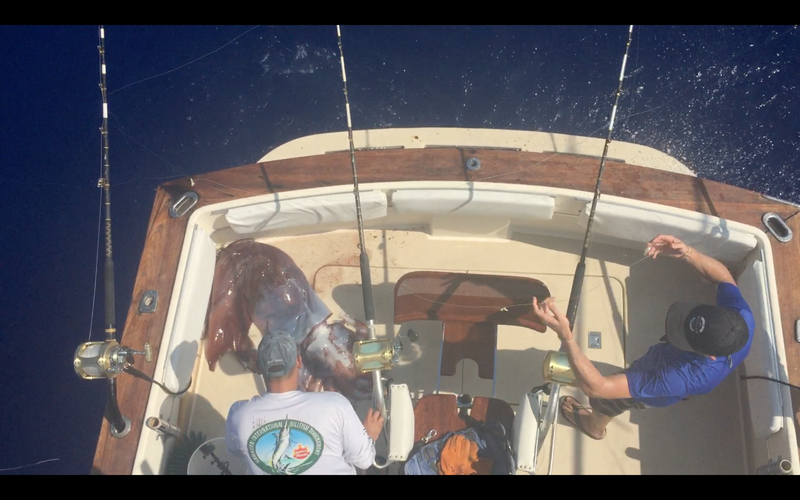 The squid was also weighted, coming in at 52.7 pounds. Afterward, it was placed on ice to prepare it for a long journey to Washington state, where researchers will examine the rare find. The marine biologist Widhalm consulted on the boat said he believes the squid to be a Megalocranchia fisheri.